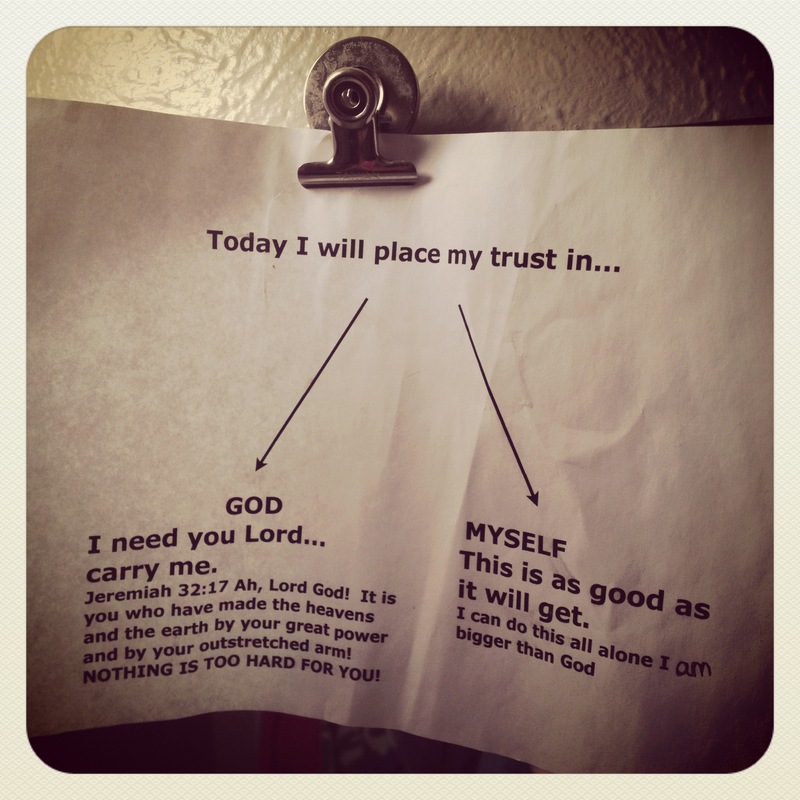 This battered little piece of paper is what I see in the bathroom mirror every morning. After a particularly hellish day battling my fourth bout of postpartum depression my husband typed this up and placed it on our bathroom mirror. At first I thought it was a bit silly for him to do this, but I never found myself taking it down. I know I’m not alone when I say that quite frequently I want to take things into my own hands. I want to feel like I can control my destiny. In truth, I don’t…I can’t…I won’t and really, I’m relieved! The Lord used His own hands to create this world, to create me. He knows what I need, He knows my desires and He knows what I can handle. I am not bigger than Him, I cannot do this alone! So, every morning when I go into the bathroom and I see this reminder it lifts a bit of weight off my shoulders. Nothing is too hard for Him. Categories: Daily Bread | Tags: God, Postpartum depression | Permalink. Oh my gosh, you did marry yourself a good one! I would know as I knew him ‘back in the day’ at Grace Chapel and his thoughtfulness did abound. I need a copy of that for my bathroom!